Is honest disagreement and debate still a Jewish virtue? It is no secret that Jews like a good debate. It’s a deeply ingrained part of our culture. I once heard Rabbi Adin Steinsaltz say that as much as the Talmud (a repository of disagreements and debates) is a product of Jewish culture, it has as much of an influence in shaping Jewish culture. We call an honest debate in Judaism a machloket l’shem shamayim, a disagreement for the sake of heaven. In other words, we don’t have to agree with someone’s opposing viewpoint, but we do have to respect the person. Matt Abelson, a JTS rabbinical student, recently completed his year of study in Jerusalem. Perhaps one of the most challenging years in rabbinical school for a whole host of reasons, it is nearly impossible to return from the experience unchanged. Abelson wrote a post in which he slams the Encounter program for encouraging students to disengage from traditional Zionist ideology when it comes to their relationship with Israel. This is a “problem” that has been gaining increased attention in the last few years. It is a tense subject for many. As I have mentioned at other times on this blog, there were figures who sought to end my own career before it even began because, despite not even knowing me in real life, they decided I was anti-Zionist and anti-Semitic. I responded to Rabbi Daniel Gordis here when he brought up the issue last year. I do not have a problem with the fact that Matt Abelson has a problem with Encounter. I do have a problem with how he misrepresents their program. I won’t go into those details here, because I already responded to his blog post there (I included my comment below the fold). I also have a problem with the notion of shirking the responsibility for responsible debate because an issue elicits strong emotion. However, I do want to pose the question, is it an acceptable response to “opt out” of a difficult discussion because it makes you uncomfortable? Go and check out his post and come back here to comment. Your understanding of the Encounter program is fundamentally flawed, and you seem to be unwilling to remedy that problem by your refusal to ever participate. Encounter does not demand silence – structured in throughout the program is plenty of dialog among participants and speakers. There is a communication agreement in practice that enforces the nature of that dialog, yet when I participated on Encounter a woman flat out told that mayor of Bethlehem that she found his opinions offensive and his language to be counterproductive to his stated goals. I would hope that as a future rabbi you would live by the teachings of our Sages: Who is wise? One who learns from all people (Pirkei Avot 4:1). Encounter encourages participants to listen more than speak so that participants can hear the perspective of the Palestinians, not to indoctrinate. The listening agreement encourages people to voice their opinions in their own words and not make general statements, but conversation is absolutely encouraged and in every session across all of the days we were given the opportunity for dialog. One thing that I want to strongly encourage you to consider, Matt, as a fellow rabbi, that it is VERY VERY VERY important to be able to engage with people with whom you may vociferously disagree about contentious issues without “blowing up” or needing to opt out – as a rabbi you will not have that option. 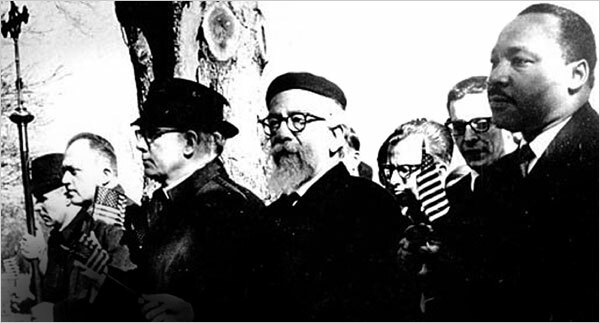 Open thread: Who are the two most influential Jewish social justice theologians? I think that Encounter is wonderful. Anything that both causes more Jews to consider Orthodoxy (see Abelson’s post) as well increasing the rift between new Conservative rabbis and their congregants should be supported. Hopefully when these congregants get perturbed by a few too many Encounter-ed sermons they might cross the street, No? Gordis and Abelson should look more at the silver lining with the cloud. Bravo to Justin, I absolutely agree that Matt’s close-mindedness defeats the whole point of his rabbinical year in Israel. It’s cowardly. That said, I think the point of Encounter is not to disengage with the Zionist narrative but to be able to understand the Palestinian narrative, whether one believes in it, disagrees with it, or otherwise. I think sometimes it is okay to opt out. Not everyone is ready to be uncomfortable in those ways at the times when we think they should. Patience is also a virtue, and maybe, or especially when we think participation in some event is so important, it may behoove us to remember that not everyone is ready in the ways that we wish they were. I had similar thoughts about Encounter before I was a participant. I even voiced them in a private meeting with the leadership of the organization before and after my first trip (I have been a participant twice). But it took me some time to build up to being ready. Even in the Encounter communication agreement it is perfectly okay to “pass for now”. Maybe we need to give everyone the same opportunity to “opt out for now”. Given up the privilege of a public voice is esp. hard for folks with tons of privilege. Can you expound on that comment? You have piqued my interest. Thanks. Hmmmm….. I don’t really see a problem with Matt’s piece, and I think the title of the post here doesn’t respond to what he wrote. Nothing in your comment on his article negates what he said. “Encounter” is basically…..how to be gentle about this…..a program that seeks to indoctrinate Americans with a Palestinian viewpoint. The program isn’t about “honest disagreement and debate” — rather it’s about shutting up and absorbing somebody else’s opinion. Based on their website the process is assisted by groovy postmodern educational jargon about “transformative methodology”, and Jews and Muslims playing patty-cake with each other. OK….interesting approach. But I’d love to see the response if this kind of “encounter” was held to engender empathy with Jews who live in the West Bank…. I don’t have a problem with Matt’s problem with Encounter (even if they are categorically wrong based on personal experience and the experience of every other Encounter alum whom I’ve spoken with, not all of whom hold left wing politics). I have a problem with the idea of shying away from something which you disagree with simply because it makes you upset or uncomfortable. I don’t think Encounter is supposed to engender empathy as much as it is intended to provide the perspective of the Palestinian families involved. I, for one, would LOVE to see a program that does an identical endeavor with Jewish families who live in the West Bank. I also presume that my friends in the West Bank would volunteer their homes to do such a thing. What would be even better if there was a program that spent time with BOTH Palestinians and Jews in the West Bank in one joint program. But, really, the point of my post was the raise the question, does the Jewish tradition encourage us to sit uncomfortably in disagreement or does it give us permission to “opt-out” if we disagree “too much.” It seems to me the former much more than the latter. Uri, I think shutting up and listening to other voices is an excellent form of therapy for white american men, esp. Jews, esp. when they come from affluent backgrounds, esp. when they have educational credentials. Never mind WHO they listen to. Still feels like a mitzvah of an exercise. Those folks have too much mindshare. Oxygen in the room. Power. Stripping them of some of it, for a little while, is a little bit of healing. I imagine shutting up and listening is good therapy for everyone, not just white, Jewish men with (lots of) privilage. Being one of those white, Jewish men with privilage I have indeed found it a good exercise at the very least in listening. I have even on occasion learned something new :). But it should cut both ways don’t you think? Shouldn’t whatever the opposite of white, Jewish, male and privileged is, also have to shut up and listen to other people? Uri, my answer is…. while everyone deserves to be heard, to be listened to, we live in a world where some people or groups get that much more than others. Engaging in a social justice activity of simply listening is valid, if you want to support a social justice endeavor. there’s even a few projects built around this. Google compassionate listening project. Or Rosenberg’s nonviolent communication stuff. All of this is painful for me personally, as I enjoy being able to make snarky remarks at all times, esp. to folks with thin skin and a legitimate reason for being sensitive. But listening to the Palestinian narrative without somehow forcing some small subset of them to honor me and my story in a transactional exchange feels super useful. I hear you. I didn’t mean to suggest that each listening opportunity is one in which each party listens to the other, transactional, as you say. But, hear me out, don’t even those groups which often get listened to less, also have to listen to the group that is listened to most often? In other words, what I often see/hear is that groups who promote the views and rights of the disenfranchised don’t feel like they need to hear the legitimate views of the enfranchised. Palestinian rights activists that I know are not interested at all in hearing the settler narrative. They feel like they already know it and they don’t like it. Sounds like what this Rabb student was saying, in part. So what if we agreed that everyone needs to listen to everyone else. At the very least, listen. I’m not sure who your implying gets phucked here, but no to both possibilities. All I’m saying is that if the majority voice needs to shut up and listen to the minority, maybe the minority needs to listen also. Seems only fair.